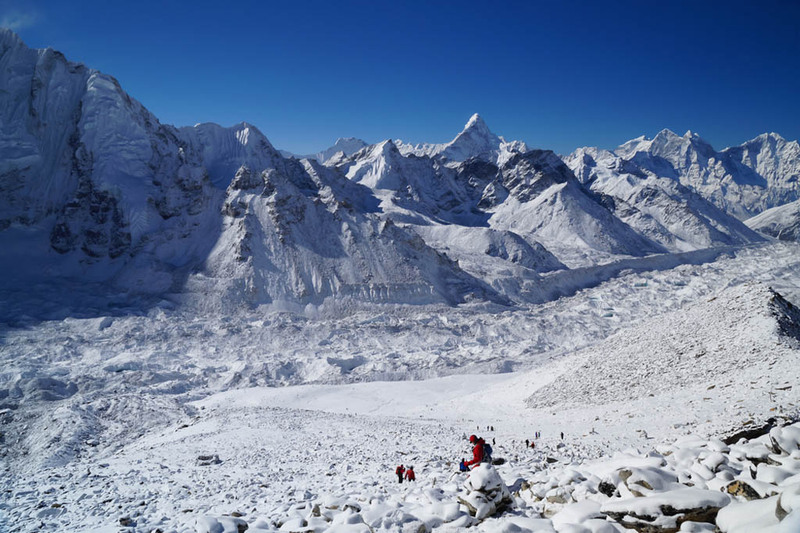 Everest Base Camp Trek - Blue Mountain Travels and Tours (P.) Ltd.
Once in a lifetime, every trekker who comes in Nepal has a desire to go or to trek Everest Base Camp. On May 29, 1953, Sir Edmund Hillary and Tenzin Norgay Sherpa successfully climbed the world highest peak the Mount Everest from Nepal side and became the first climbers. Since then Everest Base Camp Trek has been very popular for trekkers. The area has eye-catching, breathtaking view of mountain peaks, and famous for warmly friendliness welcoming local Sherpa’s. The trekking is possible for a whole year but spring & autumn seasons have the best weather condition. One can see the hedgerows & trees, bursting into blooming Rhododendrons, adding s spectacular splash of color in the landscape. And in autumn, the view is much better with clear atmosphere but the weather is cooler and days are shorter. 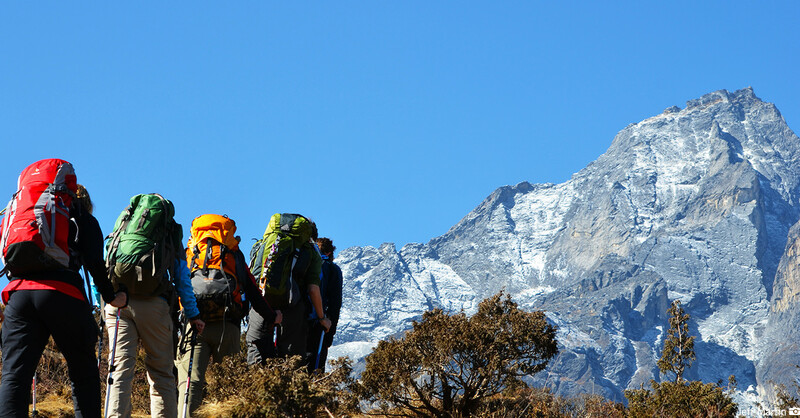 Our knowledgeable, exceptional staffs passion for trekking in this region makes your trip memorable. Trekkers have a to pass a slow ascent through wonderful local Sherpa villages, wildlife, visit number of Buddhist Tibetan monasteries. Our trek concludes with the opportunity to trek to both Lukla Everest Base Camp, at the elevation of 5380m and the nearby peak of Kala Patthar (5545m) for fantastic views of Mount Everest. With our latest updated itinerary offers an excellent way to acclimatize securely with a number of rest days. Daily 3 times meals (breakfast, lunch and dinner) during the trekking. All necessary trekking permits for Everest Base Camp trek. On arriving at Tribhuvan International Airport, Kathmandu, our company representative will be receiving you, displaying Blue Mountain Travels placard outside the airport terminal. You will be then transferred to your respective hotel in our private tourist vehicle. Our guide will brief you about the trip if you happen to arrive after 4 pm. This will be the pre trip meeting, so to know about trip please do ask all the questions and clear your doubts. And if you arrive earlier than 4 pm, on that very day, there will be your pre trip meeting at our office. In the meeting we will introduce your trek leader or guide. Please make sure you bring your three copies of passport size photos, passport and a readable copy of your travel insurance policy. Also please clear the due balance, if any, and sign the legally binding trip from and the non liability disclaimer. No meals included. Overnight at a hotel. Pashupatinath Temple is one of the most significant Hindu temples of Lord Shiva Shankar in the world, located on the banks of the Bagmati River. Here you are not allowed to go inside the temple as it is strictly for Hindus only but you can clearly see the temple and the activities from the eastern bank of the bagmati river. Swayambhunath is one of the holiest Buddhist sites in Kathmandu. Buddhist pilgrims from Tibet going round the stupa spinning the prayer wheels. With four pairs of eyes of Lord Buddha in four cardinal directions keeping an eternal watch over the people and their doings. Visit the Bhaktapur Durbar Square, once was the royal residential quarter of King Bhupatindra Malla, famous five-storied pagoda temple of Nyatapola , Dattatreya temple, Bhairavnath temple, Batsala temple, Pujari Muth and Palace of 55 windows. The rest of your time in Kathmandu is free for further exploration and some last-minute shopping in Thamel area for trekking essentials. Breakfast included. Overnight at a hotel. Today an early morning we go to the Tribhuvan International Airport in Kathmandu, and takes scenic flight to Tenzing & Hillary Airport at Lukla. The flight during is of 35 minutes. On arrival at the Lukla Airport, the guide will brief you about the trek and introduce porters before beginning of trek towards Phakding. We have plenty time to explore the village while our Sherpa crew carry our trekking equipment. We begin our trek by descending towards the Dudh Koshi River where we join the main trail to Namche Bazaar, located just above Chaurikharka. After passing through the small village of Ghat, short walk to Phakding. The walking is easy. Breakfast, lunch and dinner included. Overnight at a guesthouse. Today, we treks along the banks of the Dudh Koshi, crossing the river many time on exciting suspension bridges laden with prayer flags. 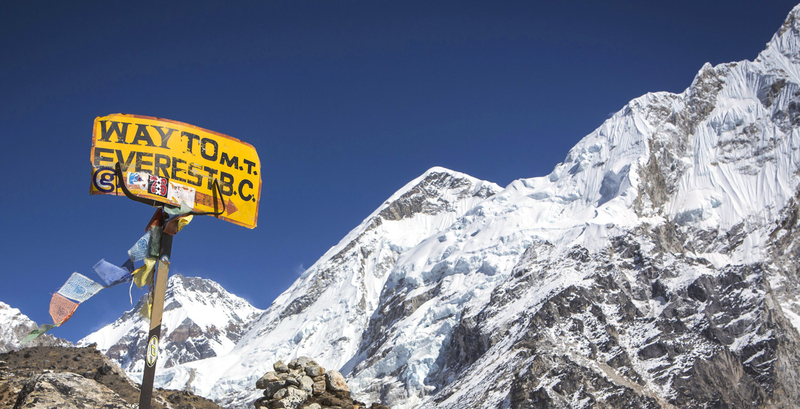 Once entering the Sagarmatha National Park, the trail climbs steeply with brathtaking views. Namche is the biggest town along the Everest trail and has quality restaurants, shopes, money exchange services, internet cafes & bakeries, lodges & hotels. Today we will spend a day in Namche Bazaar in order to acclimatize and adjust to the thinning air. We will trek a short distance to a museum that is celebrated for its exhibits of the traditional customs of the Sherpa people. 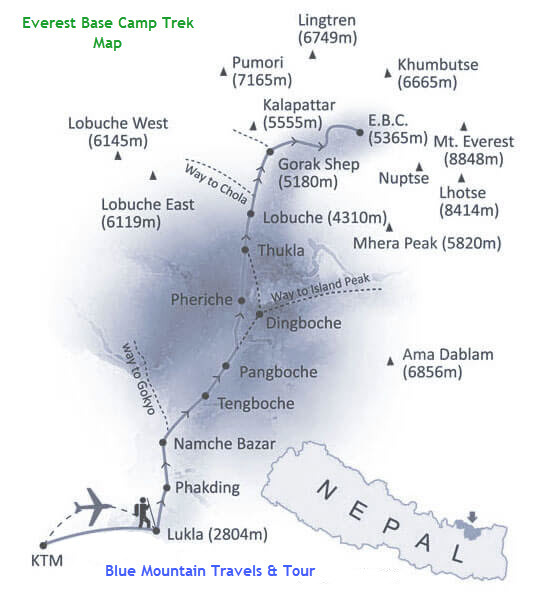 We will also hike up to Syangboche Airport and the Everest View Hotel, one of the highest-placed hotels in the world. From this point, we can see rewarding views of the Himalayas including Mt Everest. The trek continues along the rushing glacial waters of the Dudh Koshi with magnificent views of the mountains. We’ll have trekked to an altitude of 3,860m upon reaching Tengboche. Inside the monastery are incredibly ornate wall hangings, a 20-foot sculpture of Buddha, and the musical instruments and robes of the Lamas. The group will be taken to observe a prayer ceremony either in the morning or in the evening dependent on the day’s trek. From Tengboche, the trail drops to Debuche, crosses another exciting suspension bridge on the Imja Khola, and climbs to Pangboche amongst thousands of mani stones. Our uphill trek continues, taking us to the quaint traditional Sherpa village of Dingboche with views of Lhotse, Island Peak, and Ama Dablam. We take our time, so we avoid getting affected by the altitude. Today is planned as acclimatization day. We don’t go towards Everest Base Camp. Instead we will take a hike to Nangkartshang Peak just above Dingboche. The peak is an excellent view point especially of the gorgeous Ama Dablam. If weather is clear, we will get to see Ama Dablam in its entirety. You can spend the afternoon strolling around the village or resting. Today, the trail continues along the lateral moraine of the Khumbu Glacier and passes by stone memorials for climbers who have perished on nearby summits. 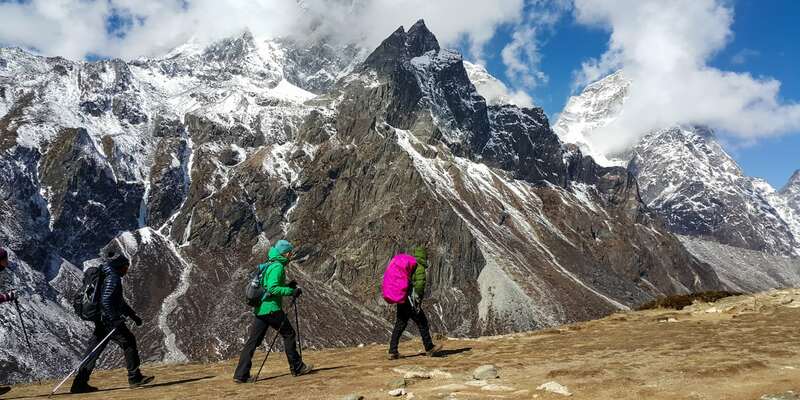 We continue to climb as we are heading to the village of Lobuche which is located at the foot of giant Lobuche peak. Today is a big and difficult day walk along the Khumbu Glacier and up to Everest Base Camp at 5,365 m, the closest you can get to Mt. Everest without mountaineering equipment. During spring, there will likely be expedition teams about to attempt the summit. The view of the Khumbu Icefall from Base Camp is spectacular. We return back to Gorak Shep for the night. Today will be one of the most difficult yet rewarding days of the trek. Most of the morning is spent climbing Kala Patthar, a small peak at 5,555 m. The ascent is demanding but the climber gets the most magnificent mountain panorama – Everest, the highest point on the planet at 8,848 m, towers directly ahead and on all sides loom the giants such as , Lhotse, Nuptse, Chagatse, Pumori and countless others. We make a quick descent to Gorak Shep and have a hot breakfast, then trek down to Pheriche. Leaving the mountains behind us, our descent takes us through Pangboche and Tengboche before continuing to the town of Namche Bazaar. We reach back to Namche in the afternoon. Today is our last day of trekking as we return to Lukla where the trek began. The afternoon is free, so you can wander about, enjoy and relax a hot shower. In the evening, have a few celebratory drinks and dance with your trek mates. We enjoy this time to reflect on the trek as a group and the personal achievement of all those who took part. Enjoying the last glimpse of the mountains we have recently visited, the 35 minutes scenic flight takes us back to Kathmandu. On arrival in Kathmandu, we are met and transferred back to our hotel. If you are still interested in extending the trip, there are many options such as Kathmandu shopping tour, white river rafting adventure, Chitwan jungle safari, mountain biking and many other activities. It may be spared day in case of bad weather in Lukla. In the evening, we will have a farewell dinner in a traditional Nepalese restaurant with cultural performances. Breakfast and farewell dinner included. Overnight at a hotel. The trip concludes, our airport representative will drop you to Kathmandu Tribhuvan International Airport for your flight departure from Nepal.